Elsa's Kopje � is an intimate luxury lodge built and managed to the basic principals of eco-tourism.� It is named after Elsa, the orphaned lioness reared by George and Joy Adamson and returned to the wild in Meru, and Kopje (meaning hill in Dutch/Africaans) for the rocky outcropping it sits on.�� Situated on Mughwango Hill at the site of George Adamson�s original camp at an altitute of 700m (2,400ft), it has break taking views of the plains of the park in front and to the foothills of Mount Kenya behind. The landscape and vegetation is fascinating, tracing the lines of ancient landforms created by the series of lava flows off the Nyambeni Hills towards the Tana River many millions of years ago. The different soil ages have created distinct patterns of vegetation from lush thick bush to sparse arid sections, a unique and eye-catching eco-system now crisscrossed by 13 tree lined rivers. African in architecture, each of the individual open-plan designed thatched cottages, enjoys a 270 degree view and blends and incorporates the rocks, boulders and trees of the hillside itself.� Furniture is all locally made, some on site and the rest by local artisans around the country. Spacious rooms with large four-poster beds, airy verandah, en suite bathrooms with hot showers or baths, flush toilets.� Bathroom water is heated by solar panels.� A personal butler is provided for each cottage from 06.00hrs-22.30hrs. Air Kenya operates a schedule air service to/ex Meru 3 times a week from Nairobi on Sunday, Wednesday and Friday, ideal for getting to Elsa's Kopje and connects on to Samburu and the Maasai Mara. Meals are predominantly Northern Italian and special dietary requirements (e.g. vegetarian or dietary allergies) can be catered for.� There is an intimate bar. The weather is generally warm with minimum humidity and very comfortable. Days are hot with pleasant nights. 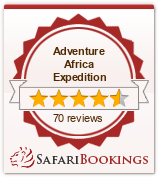 Located in South East Kenya, on the border of Tsavo East National Park, on the Athi River. One hour by private charter from Nairobi, the lodge has its own airstrip about a 10 minute drive away. If you drive it takes 3 hours drive from Nairobi. The road to Kilalinda is perfect - mile upon arid mile of cracked red earth, sun-scorched scrub, commiphora thorns the size of knitting needles. But when you arrive, Nature rolls out her red carpet - and the desert disappears. Nothing will prepare you for that first sight of Kilalinda. As you descent the path to the camp, the barren wilderness suddenly gives way to a most unexpected paradise. A waiter emerges from a cool, tiled reception with that cold drink you have been dying for. You take it and walk into the lounge, sink into a soft sofa, and allow yourself to be transported to a different world - a world of cool breezes and lush lawns, of giant red Canna lilies and tiny sparkling sunbirds, of perfect, unblemished peace. Each cottage has its own individual character, en-suite tiled bathroom locally hand-made, four-poster beds, stylish hand-dyed bedspreads and thick woolen carpets, shingle roofs, private verandah, and built so as to make maximum use of the cool breeze that blows up and down the river during the different seasons. The cracked red earth road shows how arid this area is. Sunrise breakfast on the panoramic platform high in the branches of a giant Baobab tree. A romantic alternative is to take your sundowner drinks up here and watch the sunset. Temperatures in all seasons are around 95F/35C daytime and around 70F/20C night time. The coolest month is July, with January and February being the warmest. During and just after the rains of November and April/May the area is particularly green and the river is high.